I hope everyone had a wonderful Christmas celebration and is recovering from all the feasting. Christmas this year was extremely memorable with me finally going on to the Singapore Flyer and having our first Christmas countdown with my good friend. More on that in my next post. Before I go on further, I would like to say a big Thank You to Mei Mei from Mei Mei's Signatures for giving me the opportunities to review the nail polishes that she's carrying even though my writing and photos are not as good as the other nails bloggers out there. Thank you for your kind words and for always believing in me. For today's Nails Talk, I have Black Magic from XOXO Nails. XOXO Nails was created by Elektra from New York. Her nail polishes are big 3 free that does not contain DBP, toluene and formaldehyde. Not only that, all of XOXO Nails polishes are hand made in small batches using high quality suspension base, cosmetic grade glitters, solvent resistant glitters or professional tints and pigments. 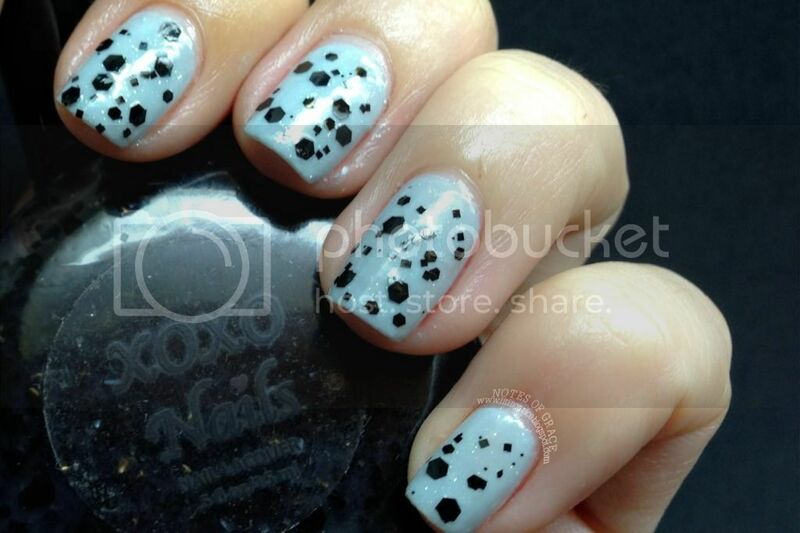 Black Magic is a clear base polish with three different sizes of hex and square glitters. Here, I have Black Magic over Girly Bits Stormy Skies. One coat of Black Magic was all I needed for the above. What I like about Black Magic is that no fishing of glitters of required. Application was pretty smooth and the plus point was that only one coat of top coat was required. Another unique factor about XOXO Nails is the bottle shape. It's a circular bottle which stands out from the usual round or square bottles and this makes storage pretty easy as well. Black Magic is retailing at Mei Mei's Signatures at SGD15.00; international shipping is available as well. Do also check out the other gorgeous polishes listed on Mei Mei's Signatures, right now there's also a Boxing Day sale going on for many of the indie polishes so it's a good time to stock up on the lovely polishes! Till the next, have a great day ahead!